The final thing I wanted to test was electric shocks. Is it safe to shock your brain? For some years scientists have been using tDCS (transcranial direct current stimulation, a small electrical charge to the skull) to try to improve a whole range of things, from learning to reaction times. Dr Charlotte Stagg of Oxford University, has been using it to help people recover strength in their hands after a stroke. Charlotte has found that, compared with a sham treatment, tDCS seems to speed up recovery, probably because of the effect that tiny electric currents have on neuronal connections inside the brain. To see what effect it would have on me, Dr Stagg carefully positioned some electrodes on my skull and turned on the machine. There was a slight itchiness and it did feel as if my brain had been given a jolt, but had it actually made any difference? The short answer is yes. In a test which involved pressing a button when I saw a light go on, my reaction times improved from an average of 650 milliseconds before the machine was turned on, to 550 milliseconds with it on. These findings are in line with results from other subjects. via BBC News – Unexpected ways to wake up your brain. Excellent study. Confirming once again how early we are in our understanding of tDCS. (emphasis below are mine). Although these studies all report positive findings there is still considerable variability in terms of the pattern of effects, paradigms used and tDCS parameters. For instance, stimulus intensity, duration, tDCS electrode montage are inconsistent. The most consistent pattern in the published literature has been to report significant improvements in WM tested in verbal n-back tasks and anodal tDCS to the left DLPFC. In other cognitive realms a patchwork of findings is emerging revealing consistent effects in memory, deception, and cognitive control. However, there are exceptions and forays into different tasks, populations, and parameters have produced different patterns of results. via Hits and misses: leveraging tDCS to advance cognitive research. OSB: What is the aim of your new trial? JC: In this study, we want to see how the effects of a brief course of fluency therapy might be increased or prolonged by using TDCS. We will use some techniques that we know will immediately increase fluency in most people who stammer, such as speaking in unison with another person or in time with a metronome. However, these techniques would normally need to be combined with other methods to help transfer this fluency into everyday speech. We will investigate how TDCS might help maintain the fluent speech that is produced using these methods. OSB: What will volunteers be asked to do? JC: Volunteers will be invited to have fluency therapy over five consecutive days, whilst receiving TDCS. In order to measure the effects of this intervention, they will also be asked to do some speech tasks before the fluency therapy, one week after the fluency therapy, and again six weeks later. We are also interested in how this combination of therapy and TDCS may change brain function and structure. So, volunteers will also be invited for MRI scans before and after the therapy. 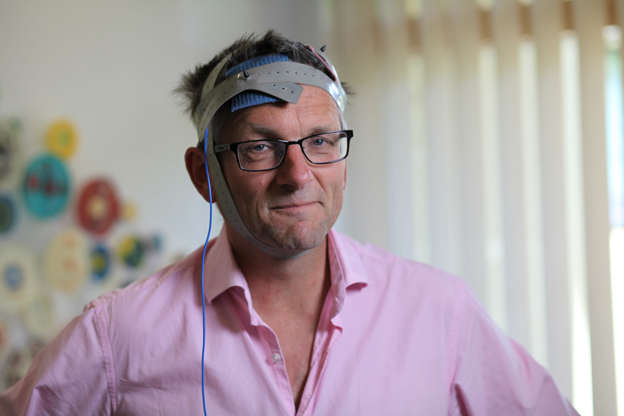 via Brain stimulation for your stammer | University of Oxford. For years we heard about ‘right brain’ vs. ‘left brain’ thinking. Now that that is turning out to be a myth I’m seeing more and more references to brain networks. And as it applies to tDCS we’re hearing about accessing regions of the brain previously thought to be inaccessible via surface electrodes. In this excellent research, Michael D. Fox (et al) access entire networks via a single node and beg the question, why Deep Brain Stimulation (a tricky and risky surgical procedure) when we can access the same networks through non-invasive stimulation (tDCS, TMS etc). In this article, we identify diseases treated with both types of stimulation, list the stimulation sites thought to be most effective in each disease, and test the hypothesis that these sites are different nodes within the same brain network as defined by resting-state functional-connectivity MRI. In both cases, the effects of stimulation propagate beyond the stimulation site to impact a distributed set of connected brain regions (i.e., a brain network). Given increasing evidence that these network effects are relevant to therapeutic response, it is possible that invasive and noninvasive stimulation of different brain regions actually modify the same brain network to provide therapeutic benefit. One unusually well-designed study, he said, was from the University of Lyon in France, in which 30 people with schizophrenia reported that after TDCS, they heard voices about 30 percent less than before. The researchers followed up with the patients, and the treatment was still working, even after three months. Frohlich decided that the schizophrenia study was so potentially life-changing for patients that it had to be replicated — and improved upon — as quickly as possible. According to the National Institutes of Health, about 1 percent of Americans have schizophrenia; many of them are too sick to work or even talk lucidly with their doctors about treatment. Antipsychotic medication helps some, but it has serious side effects. A 2013 study estimated that the costs of schizophrenia — from treatment to caregiving and unemployment — are about $4 billion a year in the U.S.
via Carolina Alumni Review – September/October 2014 – carolinalumnireview20140910-1410495196000bc357d2b34-pp.pdf. When I started this blog in 2012 friends and family thought I was crazy. But I knew something interesting was happening and now that we’re seeing all this VC money flowing into the space it’s obvious something IS happening. Still too early to tell what will become of all this, but a single ‘killer app’ (provable, repeatable, without side-effects) could launch tDCS, or another form of non-invasive brain stimulation, into the mainstream. I wonder if Thync’s announcement took Halo Neuroscience by surprise (probably not). 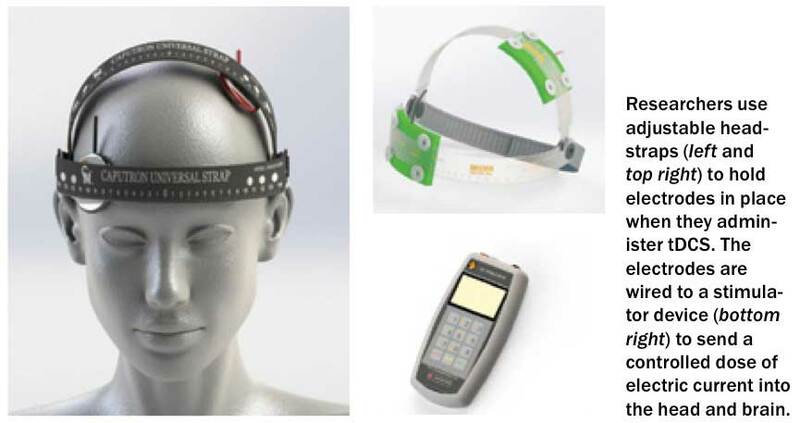 Considering how simple a tDCS device is to make, it will be interesting to see if add-ons can make individual devices truly patentable – I’m thinking built-in feedback and monitoring etc. @DIYtDCS Thank you for the inquiry. We have deep knowledge of both. Our first product will be around #tDCS. Here, from Thync’s website, they lay out the technological foundation of their ‘Vibes’ product. Founded on decades of research and results using transcranial pulsed ultrasound (tPU), transcranial direct current stimulation (tDCS) and other transcranial electrical stimulation (tES) methods, Thync elevates these breakthroughs in neuroscience to a new place in lifestyle technology. A secure Bluetooth Low Energy network enables users to control and tune neurosignaling waveforms to optimize their experience while shifting mindset in a personalized manner. Thync pursued Tyler’s ultrasound techniques for the first year, until the founders learned about studies conducted at the Wright-Patterson Air Force Base in Dayton, where researchers had tried to improve pilots’ cognitive abilities with electrical stimulation. Reasoning that the electrical method, with its rapidly improving science, offered a safer, quicker route to the market, Thync switched gears. Since then, the company has worked to shrink the electrodes and develop its algorithms to produce a reliable, comfortable experience. DIYtDCS CCNY completed 90 subject 6-week (5 session per week) trial using Thync and Soterix tech. Exciting details and results coming soon. Excited to see the results of these tests. Also, as long as we are heading into the consumer space, it’s great to have Dr. Bikson involved. @DIYtDCS Neurotrek was our initial company name before becoming Thync. However, we have no relation to any Neurotrek CES products. P.S. Thync hit it out of the park with the naming of their company/domain/Twitter handle. Thync’s Wearable Won’t Just Measure Your Mood, It Will Fix It – IEEE Spectrum. “We wanted to test the hypothesis that these various stimulation sites are actually different spots within the same brain network,” explains Fox. “To examine the connectivity from any one site to other brain regions, we used a data base of functional MRI images and a technique that enables you to see correlations in spontaneous brain activity.” From these correlations, the investigators were able to create a map of connections from deep brain stimulation sites to the surface of the brain. When they compared this map to sites on the brain surface that work for noninvasive brain stimulation, the two matched. via New clues revealed to understand brain stimulation — ScienceDaily. By cataloguing the areas of brain damage in the veterans, and cross-referencing that information with data on their deficits and difficulties, Barbey, Grafman, and their colleagues have been able to map out the neural circuits involved in general intelligence, emotional intelligence, and social problem-solving. They recently discovered that many of the same brain areas—a network of structures in the frontal lobe and parietal cortex—underlie all three of these abilities. Historically, many psychologists have viewed general intelligence as separate from social and emotional intelligence, Barbey said. But these results fit with the more recent view that these skills are intertwined and interrelated. “The brain is not making a strong distinction between these forms of intelligence,” Barbey said. via Vietnam’s Neuroscientific Legacy – The New Yorker.